Aligarh: Aligarh Muslim University (AMU), B Tech final year student, Ashar Shahid with his social start-up idea of ‘E-Doctor’, a fitness tracking mobile application won the top prize at the Social Start-up Idea Competition 2017. The event was held at the Frank and Debbie Islam Management Complex, AMU. A team of B Tech students, Rubeena Afreen and Saba Shahnawaz were the first runner-up for their idea, ‘Cardio-Box’, an ECG monitoring device using cloud based technology. Fasludeen (PhD student, Agricultural Sciences) was the second runner-up for his idea of waste management and recycling. 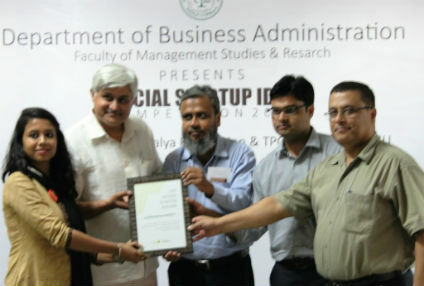 Fifteen teams were selected to pitch their social start-up ideas in the competition. The Faculty of Management Studies and Research and the Department of Business Administration in collaboration with the university’s Training and Placement Office (General) and Kavilya Education Foundation had organised the event to promote social entrepreneurship amongst students. Mr Salmanuddin Khan (Project manager, facilitator and former Gandhi Fellow at Kaivilya Education Foundation), Mr Akif Ahmad (Interest Aid foundation), Mr Akram Hassain (Former risk analyst turned social entrepreneur) and Mr Manish Sharma (Leading real estate businessman and social director, Career Leap Education Foundation) were the judges of the competition. The event also had Ms Upasa, Mr Masood, Ms Kritika, Dr M Naved Khan and Dr Asif Akhtar to encourage the participants. Welcoming the guests, judges and participants; Prof Parvaiz Talib (Chairperson, Department of Business Administration) said, “over the years, social entrepreneurship has become a field in which genuine professionals are investing their time and money.” He pointed out that after the mandatory requirement of ‘Corporate Social Responsibility’, there is an influx of funds and talent in this sector. AMU alumnus, Mr Salman Uddin Khan said that since the government schools lack resources, he had decided to work on the cause. Mr Khan is working with 70,000 teachers and over 24 lakh students across 22 districts in Haryana. Mr Akram Hussain discussed the works of Piramal Foundation, Kaivilya Foundation and Gandhi Fellowship programme and how they are trying to develop leadership in education sector. Mr Saad Hameed (Training and Placement Officer—General, AMU) said that these events will inculcate the spirit of entrepreneurship among students. He also proposed the vote of thanks. Dr Ahmad Faraz Khan was the Faculty In-charge of the competition. Students from various university departments participated in the programme. NGOs Soch and Youth for Change worked tirelessly to rope in participants in the competition.